The park had only been open for a week into the new season. Staff was very friendly, helpful and polite. The park was a former KOA and is in need of some updating. All roads and site are dirt. The roads have many potholes that need to be fixed. Roads and sites are very tight (tree lined) Some Tree overhangs are low, I had a back in lakefront site (209). Our rig is 33' long and was very tight backing in. You need a spotter. Power pedestals are in need of some maintenance. We did not use the bathrooms so can not rate them. No Wi-Fi, no cable. OTA rigs antenna picked upped 30 channels. We would stay there again but the rate is a little high even with our GS discount. 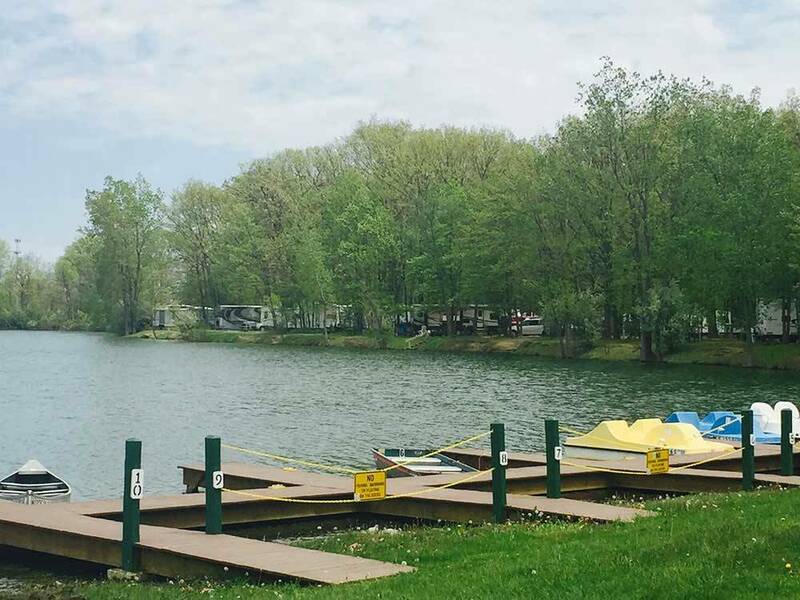 Park is full of 100% stay RVs that function as lake side vacation homes. Many of them appear to be incapable of being moved (towed or driven). Fireworks were set off at night (yet banned), kids swimming in 'No Swimming' areas. Dirt roads and dirt RV sites. Oh well, it's the only game in town in the Detroit area. 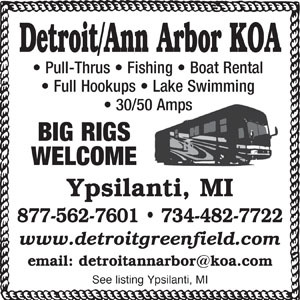 This use to be a KOA - I know why they aren't KOA any more. Arrived 5/10 departed 5/14. The clerk was not overly friendly. It rained that evening and until we departed the 14th.. Not their fault. We did laundry Sunday, can only use cold water to wash in, game room had no games and was the waiting area for the laundry room, it was probably 40 degrees in there. A woman who worked there came and told us rudely to move our truck. We had asked a man who worked there where the laundry room was he was extremely rude. Apparently my cancer scarf set him off. What a miserable place. We couldn't get out of there soon enough. It was actually oppressive and it wasn't just the weather. If I could rate it negative stars I would. There was a very pretty swan on the lake. Been camping Here for the last 4 years. It is a nice quiet place with spacious sites. Beautiful lake. Great for kids. The only negative i can point is the muddy it gets when it is raining, no cable and Wi-Fi isn't the best. Only one bath house by the office. Our site got muddy when it rained. Great jumping off point for Detroit. An expensive & old KOA that must not meet KOA standards anymore. No wifi, limited 50 amp service & no cable. Restrooms are old. Staff is not friendly & the local park residents don't want you there. Washing machines are cold water only. Good family place with great stuff for the kids. Pleasant staff and work campers. However campground is all dirt roads and very dusty. Dog even showed sneezing signs due to dust and our RV, car and equipment was dusty. Campfire placement not always in a desire able place. Close to roads etc. Otherwise, nice place and don't remove it from your potential places to stay based on this. We were disappointed at this campground. I resent being charged full price for a campground that was CLEARLY not ready for the season. If the campground is not at 100%, we shouldn't have to pay 100%. When we checked in the employee messed up the dates on our stay. The driveways into the park, in the park and near the office are FULL of potholes. Huge holes! Why aren't they filled in? We went up to do laundry and ALL of the washers were broken. How can you advertise laundry service when you don't have any? When we went back up to the office a few days later, another female employee didn't know how to use the computer and we had to stand there for 10 minutes until she could figure out how to use the printer to give us our receipt! We never did get an updated car tag for our car! Why are the employees not adequately trained for customer service? And this campsite charges the highest prices for propane - ever! What criteria does Good Sam use to rate their campgrounds? We were misled on this one. Very disappointed.